A challenge to sharing the history of a community is getting people to take interest in it. After all, community history is something that happened years ago with people who aren't very famous, some will say. How fun could it be? My son Luke probably had the same idea until he joined me last year on a trip to the Fort Croghan Grounds and Museum for Fort Croghan Day. This year's event is 9 a.m.-4 p.m. Saturday, Oct. 13, at the museum, 703 Buchanan Drive in Burnet. As we stepped into the early settlement, a woman dressed in pioneer garb complete with bonnet took Luke by the hand and led him to a big wash basin. Then, she pulled over some old dungarees, handed a washboard to Luke and showed him how to use it. Within a few minutes, Luke was laughing away at the thought of having to wash clothes like that. Before we could go two more steps, a grinder mounted on the edge of a table caught his eyes. “Ever grind corn?” another woman asked. Luke shook his head, and, before he knew it, this Fort Croghan Day volunteer had him grinding corn followed by another session of grinding coffee. “That’s how they did it,” the woman said. By now I thought for sure Luke would want to head for the car and the modern conveniences of his iPad and TV. Yet, he looked down the series of authentic cabins and buildings set on the south side of the fort and went to the next one. This time, it was a dog-trot style cabin with a group of dulcimer players gathered around, plucking and strumming tunes. We sat for a moment, but then Luke spied the fort's one-room schoolhouse. This being a Saturday, the last thing I thought Luke would want to step into was a school. But there he went, right into class. This time, volunteer Amy Peek, portraying a mid- to late 1800s school teacher, gathered Luke and one other boy and began teaching. She pulled out a few books that students of early Burnet County might have used. Both Luke and his new classmate listened, asked questions, and enjoyed their time in the schoolhouse. The volunteers, community members, musicians, and re-enactors dressed in period clothing, doing things early settlers did brought history to life for those few hours that Luke and I spent at Fort Croghan Day. At one point, I wasn’t leading Luke, he was leading me. The museum is a great place to discover Burnet County history with its displays of authentic items, cabins, and buildings. But it's the volunteers who make it such a special place to visit, especially during Fort Croghan Day. If you’re looking for an excuse to get out of the house for a hour or more this Saturday, and you want your kids to learn a bit about local history in an engaging way, head to Fort Croghan Day. Admission and parking are free. 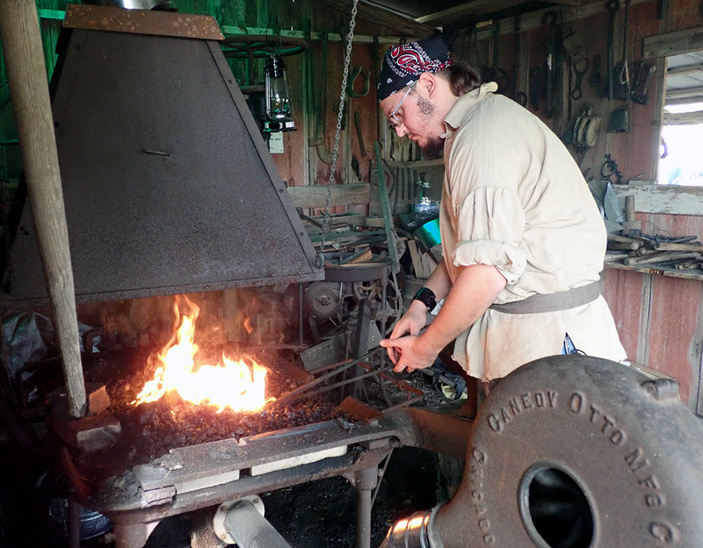 Fort Croghan Day is being held in conjunction with Octoberfest and the Burnet Art Festival. Go to www.fortcroghan.org for more information on the museum and fort.